Yin/Yang yoga classes combine a powerful vinyasa flow sequence with yin yoga. The vinyasa cultivates yang energy by focusing on developing stamina and strength, whereas the yin sequence aims to stretch the deep and dense connective tissues in the body with long and passive holds. This practice is great for those who wish to combine the benefits of improving bodily strength and flexibility, while also rehabilitating joints and connective tissues. A powerful, fast paced yoga practice that is guaranteed to make you sweat! 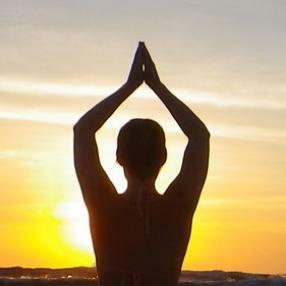 Yoga poses are done to an uplifting music playlist. Classes are geared to students craving intensity and who want to build strength and balance. A Hatha class which links postures (asanas) with the breath (pranayama). Poses will build upon each other, allowing for creating inner heat , releasing blocked energies and toxins, gradually increasing strength and flexibility. The class will incorporate a number of detoxifying poses as well as meditation, enabling students to feel cleansed, balanced and completely relaxed after class. A class that integrates elements of Pilates, dance, cardio & strength training. Great for toning the abs, legs, thighs and buttocks. A fun and challenging work out that will give you amazing results! Absolute no prior dance or ballet experience required. This class is dedicated to the untapped resources of our life-force. The power of breath flows in each asana (yoga posture)...may we breathe fully in each moment. The power of is we choose love in all ways and all your body. Sweat your prayers in this delicious flowing sequence of soul felt asana. Check our website for monthly updates. We work very hard in our lives, and while we may sleep, we rarely take time to rest. Our warm restorative yoga focuses on relaxing the body in restful postures and help us learn to relax and rest deeply and completely. During deep relaxation, all the organ systems of the body are benefited. These benefits include; the reduction of blood pressure, serum triglycerides and blood sugar levels in the blood, the increase of the "good cholesterol" levels, as well as improvement in digestion, fertility, elimination, the reduction of muscle tension, insomnia and generalized fatigue. A class holding postures longer focusing on the alignment of the body with the ease of the breath- your body will say thank you. Emphasis is on gently revving the body and bringing balance after a long day. This class will help give your nervous system a much-needed nurturing while connecting with your breath and let go of the days tension. Close practice with constructive stretching to bring awareness inward. All skill levels. A slow meditative flow yoga class that will allow you to access your inherent creativity and connection to the Self. Absolutely no prior yoga or meditation experience required, just a willingness to explore the space within and without. Create a deeper connection to the Self and learn how to control the mind and the senses through meditation and meditative movements.